Harmful algal blooms, or red tides, can occur naturally, but new research indicates that after an oil spill, the application of dispersant may increase the chance of red tides. A new paper recently released in Environmental Science and Technology provides experimental evidence that oil and dispersant applications may open up a hole in the food web that toxic bloom-forming algae take the opportunity to fill. When an oil spill occurs, they can disproportionally kill the single-celled animals that prey upon algae that create red tides. “Our understanding of what controls formation of red tides are surprisingly scare and even more so are the research on the impacts of dispersants to red tides.” The recent study is one of the first to investigate the effects of oil, dispersant-treated oil, and dispersant on the structure of natural plankton communities from the Gulf of Mexico. Their research discovered a troubling insight that the application of dispersant to oil can be even more deadly to ciliates and tintinnids than the oil alone. “Ciliates are like an army of voracious tiny ‘pac mans.’ They are some of the main predators on algae that can cause red tides,” said Dr. Buskey. Buskey and his colleagues, Dr. Rodrigo Almeda from Technical University of Denmark, and Dr. Sarah Cosgrove from The University of Texas Marine Science institute, research showed that after application of oil and dispersants and in the new absence of ciliates, algae capable of causing red tide blooms flourished. 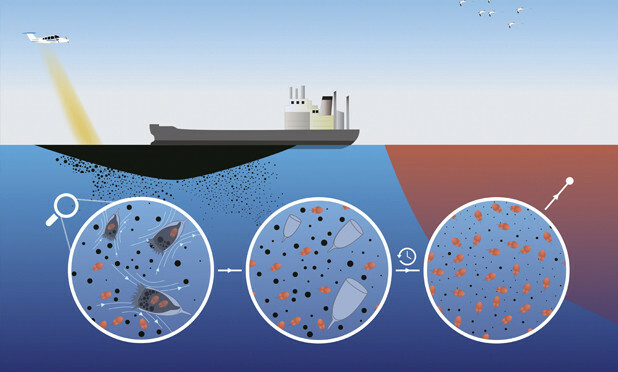 Their research also suggested that the potential impact of application of dispersants after an oil spill may be more profound in coastal areas closer to shore where the ciliates and the red-tide algae are more abundant. This may be particularly troubling, because the researchers found that the coastal algae, Prorocentrum texanum, which can cause diarrheic shellfish poisoning in humans can withstand, and even dare say - like, oil. In fact, they notably increased in concentration when oil and dispersant were added. Buskey cautions “it’s important to remember that an oil spill and application of dispersant will not always cause a red tide since the potential occurrence and magnitude depends on the specific circumstances of a spill, including the environmental conditions, nutrient availability, and plankton community composition.” The research does suggest that given the importance of ciliates as grazers of red tide forming algae, that the possibility of red tides due to planktonic food web disruption should, at least, be taken into consideration when evaluating the potential impacts of oil spills on marine environments. This research was made possible by a grant from The Gulf of Mexico Research Initiative, the Danish Council for Independent Research to R.A., and a Hans Christian Ørsted Postdoctoral fellowship from Technical University of Denmark to R.A.